Congratulations! You have a rower in the family. Your child has been captured by a wonderful, lifelong sport. He or she will build muscles and endurance .. and character, by learning the value of persistence, dedication and teamwork. This booklet of information is intended to help you get a handle on what is happening. It describes the sport of rowing, the famous (no kidding!) TC Williams rowing program, and the community of parents, friends, and supporters that makes it all possible. A community, by the way, that is delighted to welcome you. It’s the sport of competitive rowing. Boys and girls in long, narrow boats (called “shells”) race against each other, and the clock. They race against other rowers of similar age, weight or ability, and the boat with the fastest time over a prescribed course (usually 1500 meters) is the winner. The concept is simple, and it’s easy to learn the basics. However, there’s an enormous amount of skill involved in propelling that foot-wide craft through choppy waters with 12-foot oars, and it takes more teamwork than practically any other sport. It takes strength, endurance, balance, concentration, coordination, and the will to win that makes you push through the pain to be the fastest boat on the water. In fact, many say that rowers are the world’s finest athletes. The term “boat” refers to a team. It can be eight, four, or two rowers, or even a single rower. In addition, most boats have a coxswain (pronounced “cox-n”), the on-board coach who steers the boat (being the only one in the boat who faces forward) and communicates to the rowers through an on-board PA system (the “cox box”). Boats are classified by the number of rowers. With the “cox,” an “eight” will actually have nine members on the team. The vessel they sit in is a “shell,” a lightweight, streamlined boat with sliding seats and oarlocks extending over the side. It’s a craft built for speed. Rowers will either control a single oar (sweep rowing) or two oars (sculling), and the class of boat depends on the number of rowers and the way they’re handling the oars. Sweep rowers come in twos, fours and eights. Scullers row alone (singles), by twos (pairs), or fours (quads). All eights have a coxswain; twos and fours may or may not have a cox. Most TC Crew boats are sweep eights or fours. Boys and girls row separately in competition. In each class there is a varsity eight, and there may be a second eight, third eight, etc. The junior eight is a class in which all the rowers must be younger than 17. The freshman eight, as the name implies, can only be 9th graders (8th graders can row at TC, but are not permitted in some competitions). There also are weight-classified boats, such as lightweights, in which no participant can be heavier than a specified weight. Individual rowers are identified by the seat they occupy, starting at the bow (front) with the 1 seat. Occupying the 8 seat, commonly known as the “stroke,” is an experienced rower who sets the cadence for the boat. There are lots of other terms to learn. Don’t worry. You’ll be speaking fluent “crew” in no time. Click here for a glossary of rowing terms. Rowing has a rich history in the Alexandria public schools, where it has been a sport since 1947. The Old Dominion Boat Club at the foot of King Street, organized in the 19th century as a rowing club, was the first sponsor of public school rowing in Alexandria. This proud tradition is reflected in the rows of plaques that line the walls of the Dee Campbell Rowing Center, the state-of-the-art equipment and facilities, and the recognition that our crews receive at national and international regattas and among college coaches. Eligibility. Students from eighth through twelfth grade enrolled in the Alexandria City Public Schools may row. Students who have completed seventh grade are eligible to row in Summer and Fall Crew. TC Williams requires academics first. A student needs a cumulative average of C (2.0) or better in all courses combined the preceding quarter to participate. One cumulative D will not affect eligibility. Two consecutive cumulative D's will result in immediate ineligibility. To ensure class work is being completed each teacher sends an assessment form to the Athletic Department certifying academic eligibility for the week. Poor class performance can result in referral to a study hall or not being allowed to race for two weeks. Safety. Physicals, swim tests, a rowing safety video and instruction, coaches in launches with radios and emergency kits, and communication with weathermen and marine police are standard policy. TC Williams and Alexandria Crew Boosters have developed one of the nation's most comprehensive rowing safety programs. Coaches, rowers and parents work together to ensure safety at all times, in practice and competition. Sports Physical. The Virginia High School League (VHSL) requires a physical exam for anyone playing a sport. A physical is good from June to June. Get a form below. If you get a physical for Summer Crew be sure to indicate on the form all possible sports the student might play during the school year! You can get a free physical at the Adolescent Health Center on Braddock Road. No student can practice if this form is not on file. Swim Test. No student may get in a boat until he or she passes a swim test! The test is administered at the Chinquapin Rec Center, next to TC Williams, at the beginning of the spring rowing season. Alcohol, Tobacco and Illegal Drugs Guidelines. Students possessing, using or selling these items on campus or on a school affiliated bus will be reported to appropriate authorities. Crew members possessing, using or selling these items during the crew season will be subject to disciplinary action. Coaches can be teachers or members of the local community. All are experienced and trained in rowing and safety, and often they are former TC rowers. Each coach is responsible for a maximum of two boats. They guide the workouts from launches that follow the shells on the water. Launches are equipped with radios and safety equipment. What do they expect? Show up, work hard and have a good attitude. If a rower has to miss practice, they should call or text their coach. If a rower is really sick or hurt, call or speak up. Coaches will thank you for not passing on the chicken pox! No one wants students to row with an injury; use common sense. Everybody. The mix of boats on the TC Williams Crew depends on the number of rowers that turn out each year. It’s impossible to say at the beginning of the season how many boats of which type there will be on the TC Crew, because EVERYONE ROWS. That’s right. Every student who meets the basic qualifications and comes to practice will be on a boat, competing at some level during the season. Crew is competitive. No one is cut from the team and everyone rows, but the upper boats are hard to get in. Ability, seat racing and erg times, conditioning and attitude all play a part in determining the makeup of a boat. Illness or injury can be a factor from week to week. Coaches aim for fast boats that can win on a given day. Alexandria is fortunate to have one of the best public school rowing facilities in the nation - in fact, it is one of only a handful of public schools with its own boathouse. The Dee Campbell Rowing Center, at the foot of Madison Street on the Potomac, is state-of-the-art. On the ground floor is storage space for shells, launches and oars. Upstairs there are offices, locker rooms, and a workout room with exercise equipment including weights and Concept2 indoor rowers, or ergometers. You’ll hear a lot about the “ergs.” These are the sophisticated rowing machines used for off-season conditioning and on-land training throughout the year. Practices are on the Potomac. Boats on the water may range from Fort Washington to Georgetown, depending on weather, conditions on the river, and the skill level of the boat. There is always a coach in a power launch with the shells on the water. Races are conducted at sites up and down the east coast, from Philadelphia to the Occoquan. Unlike other high school sports, rowers race against private as well as public schools, and the competition can come from anywhere in the US and Canada - or beyond! Scholastic rowing is a spring sport. Practice starts in late February, after school (until dark) every week day, with bus transportation provided. Before the regatta season begins, Saturday practice is in the morning, generally quite early (6 am) or as directed by the coach. Rowers practice during spring break. Don't plan any vacations if you have a rower, or find a home for your rower if you go away! Missing practice (unless you are ill) can mean the difference when seats in the boats are chosen. It is important to let coaches know if there are extenuating circumstances. Rowing is a physically demanding sport. Pre-season conditioning is necessary. This includes erg work, weight training circuits and a great deal of running for leg strength. Rowers are always training, either on the water or in the Boathouse. Rowers are encouraged to play other sports and/or train off-season. The TC weight room is open after school during the winter. TC Williams sponsors a free winter conditioning program at the Boathouse, open to Alexandria public school students. Periodically coaches will record rowers' times on the erg. Erg tests are typically 2000 meters. Comparing size, strength, and times helps them put together the right combination of rowers in a boat. 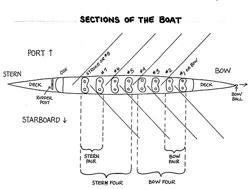 This is called "making a seat" in a boat. Rowers wear many layers. They start with warm-up suits in February and end with tank tops by June. For competition, rowers must purchase official uniforms, which are sold at cost. Financial assistance is available if necessary. Ask your coach. Many of the things they wear will say TC CREW. The TC Crew Closet sells sweats, t-shirts, caps, anoraks and other items with crew insignia. These can be ordered or purchased at the Boathouse open houses and regattas. Major regattas will feature a signature shirts. They cost about $15. Every rower wants one, and they are popular items for trading at regattas. TC shirts have proven to be valuable commodities. Anoraks. These are classic TC Crew jackets. They are expensive, but last forever. They can be seen all over the world on ex-TC rowers. Purchase of an anorak is NOT required. Again, these can be ordered at the Boathouse. Everything! Actually, everyone except most lightweights eats lots of carbohydrates – pasta, pizza, bagels, etc. Ask your rower what the coach suggests. Many boats follow the tradition of a Friday night dinner during the regatta season. Some boats rotate to a different rower’s house each week, while others find a welcome home and never leave. Whichever way they do it, they load up on pasta and psych themselves for the next day’s race. This fosters close friendships that can last a lifetime! While there are incidental costs, TC Williams does not charge rowers a fee to participate in crew. (Other school programs charge up to $1000 or more per rower.) The Alexandria City Public Schools pays the coaches, insurance, maintains the Boathouse, buys some equipment, transports the crew and their equipment to regattas, and pays for overnight accommodations when necessary for the rowers. Thank them often for their support! So what does it cost? Mostly your occasional help at regattas and some fund-raising events. Fund raising is important for us. Each family is strongly encouraged to join the Alexandria Crew Boosters. The only other direct costs will be for uniforms are a nominal fee for food at major regattas. However, no student will be without a uniform and food at out of town races for economic reasons. Crew Boosters will cover such costs to make sure that no one is discouraged from participating. And while we don't go door-to-door in our fund-raising, it does require volunteering for a couple of fund-raising events in addition to helping at regattas. Be sure to come to the spring sports awards night at TC Williams in June. Coaches present varsity, JV and freshman letters, as well as scholar and other special awards. Many boats give gifts to their coach. Everyone gets to give a speech (or so it seems!) It is a special night. In December, there is a Holiday Open House and Rowers Reunion, to welcome past and current rowers at the Boathouse during the December winter break. In mid-March, before the start of the racing season, parents and friends are invited to the Boathouse to see the equipment and christen a new shell. This is a good time to meet the coaches, see the equipment up close and learn about the sport. TC Crew participates in a series of competitions each spring. Only a few of them are on our “home field,” the Potomac. Regattas may have races between two schools, or as many as a hundred or more. Parents are encouraged to attend as many races as possible. Regatta season starts in late March, with the Run vs Row Regatta (an Alexandria Crew Boosters fund raising event) in Alexandria. Other scheduled races are on the Potomac in Georgetown, the Occoquan Reservoir at Sandy Run Park, the Anacostia River in DC, and at St. Andrews School in Delaware. The big events are in late April and May - the Virginia Championships and the National Capital Area Championships on the Occoquan, the Stotesbury Cup in Philadelphia, and the Scholastic Rowing Association “Nationals.” Qualifying boats from TC Williams may go to the Canadian Nationals in June, and even the prestigious Royal Henley Regatta in England. TC Crew competes in two regattas at St. Andrews School in Middletown, Delaware. Rowers are transported by school bus to these races, that will have you out of town most of the day. The Virginia Championships is held on the Occoquan Reservoir at Sandy Run Regional Park. Buses run several times a day from TC Williams to the race site, to ferry rowers back and forth. This is also the site for the SRAA Nationals Regatta when it's held in our region, and local regattas nearly every weekend. Many Northern Virginia schools use Sandy Run as their home base. Qualifying upper boats go on the Stotesbury Cup Regatta in Philadelphia, the country’s largest scholastic regatta, the third weekend in May. Boats are loaded on trailers, and participating rowers ride school buses up on Thursday. Some preliminary heats are Friday starting at noon, and lasting until dark. Some also run on Saturday morning. The school pays for students to stay at a hotel and Crew Boosters provides breakfast and lunch under the tent. Rowers take munchies, along with pillows, tape decks, clothes and money (for the ever present regatta shirts). Finals start at noon Saturday. Many parents go up for both days. It’s a great location for a regatta. In addition to watching the races, parents staff the food tent set up for TC Crew, and may eat there as well. If you plan to go, make hotel reservations early. Crew Boosters usually reserves a block of rooms at a Philadelphia hotel. Qualifying boats may go on to the Scholastic Rowing Association of America (SRAA) Championships (Nationals), or the Canadian Scholastic Nationals. The SRAA Nationals is a two-day race, held in a different location each year, usually in the mid-Atlantic. The Canadian Championship is an exciting international regatta, on a world-class 2000-meter racecourse in St. Catharine's, Ontario (near Niagara). Be sure to attend the regattas, and allow yourself plenty of time to get to the race site. In some cases, you may have to walk quite a ways from the parking area, and race schedules can change unexpectedly. Don't miss the race you came to see! Directions to the out-of-town races are published in the Cox Box newsletter, and on the Web site. You can also sign up for a weekly e-mail Hotline during the season, which provides last-minute tips. Bundle up. The weather is unpredictable in April, and standing all day beside a river or lake can get pretty miserable if it’s cold and wet. It’s better to stow a rainjacket than wish you had one. Look for the tent at most out-of-town regattas. Crew Boosters sets up a tent on the race course. It’s a place where rowers can rest and get something to eat and drink, and parents can congregate and watch the events on the water. Parent volunteers do it all - set up the tent, prepare the food, and make sure everything runs smoothly. It’s like tailgating on a grand scale! Most regattas are all-day events. Even though the rowers may not be on the water for more than a half hour, they have to prepare the boats and load them on the trailers, unload them at the race site and set them up, and then stow them back at the Boathouse at the end of the day. Coaches expect all rowers to travel as a team to and from out-of-town regattas. Unlike most other public school rowing programs, Alexandria does not require a hefty participation fee for each rower. But it takes money, and lots of people, to support a top-notch rowing program like ours. That where Crew Boosters comes in. Alexandria Crew Boosters Club, Inc. (ACB), organized in 1951, is parents and friends who want to see TC Crew stay at the top of the rowing world. We do the bulk of the fund raising to buy the best and safest equipment for the rowers, and provide the people power to help the program run smoothly. ACB officers and Board members are elected each June, and membership meetings are held in October, March and June (at Awards Night). Most of the equipment, including shells which cost over $50,000 each, are purchased by the Crew Boosters. In addition to organizing and running fund raising events, parents also work at the race courses. We have fun, learn about the sport and get to know other parents and students. Some of us even row! The following lists some of the major ACB activities. Alexandria Community Rowing. This is the adult rowing program that was established to financially support the high school program. There are lessons in sweep and sculling for youth and adult members. ACR members participate in spring, summer and fall regattas for adults along the East Coast, fall racing for youth in club singles and doubles events and winter conditioning classes. Fees from adult activities support the high school program. Summer Crew. Alexandria Crew Boosters conducts a summer crew program for novice and experienced rowers starting mid-June through July 31. Adults and youth are welcome. Your are required to complete a high school physical and swim test. Novice rowers (rising eighth grade through adult) learn to sweep row (one oar). More advanced youth rowers can learn to scull (two oars). This is a relaxed activity. Rowers come and go on vacation but they can still learn a lot. The final day of Summer Crew is a regatta on the Potomac, the “Blue Plains Sprint.” This is a chance to see what the novice crews can do. Everybody races! Come for breakfast! Fall Crew. Alexandria Crew Boosters offers a fall program for both scullers and sweep rowers open to any experienced high school student. Novice sweep rowers in eighth grade or above who have not completed a full racing season may also participate in Fall Crew. Space is limited in the singles, doubles and quads. There is a fee, but some scholarships for Alexandria students are available. ODBC Fall Crew. Alexandria's Old Dominion Boat Club sponsors a youth team for the fall racing season. This select program, administered by Alexandria Crew Boosters, is open to varsity level rowers from high schools throughout the area. Fall racing is a club sport, and the ODBC crew competes in elite regattas up and down the east coast. MidAtlantic Erg Sprints. Erg races - rowers competing on erg machines - are held the first weekend in February. Over 400 rowers and health club members from New England to North Carolina come to George Washington Middle School to row indoors. Alexandria Crew Boosters sponsors this event, and students compete and help as timers. Crew Dance/Car Wash. The first Saturday in May is SAT day, so there are no races for the upper boats (lower boats may have a local regatta). During the day, there is a fun car wash where students raise money for TC Crew and in the evening there’s a dance at the Boathouse. Crew Boosters maintains this Web site. During the rowing season, Crew Boosters also publishes last-minute information about coming events. Ask a coach or parent for details. There’s more to Crew Boosters than fundraising, though. It takes people - parents and friends who will take a little time to help make the program run smoothly. Regattas don’t just happen, after all. At local regattas, parent volunteers serve as parking attendants and stake boat holders. They drive launches and run concession stands. We need EVERYONE to come out and help make these events successful. And when we go beyond the DC/Northern Virginia area, parents are needed to buy, transport, prepare and provide food for our rowers at big blue and white tent (not to mention transporting the tent, setting it up and taking it down). Be sure to say “sure” when somebody calls and asks for your help. But don't wait for a call! Contact a Board member Task Leader and offer your services. It’s rewarding ... and fun! This handbook is just an introduction to the wonderful world of rowing. There’s lots more information available. Surf the Web site for the latest news and access to lots more information. Or just ask any “old timer” or Board member.